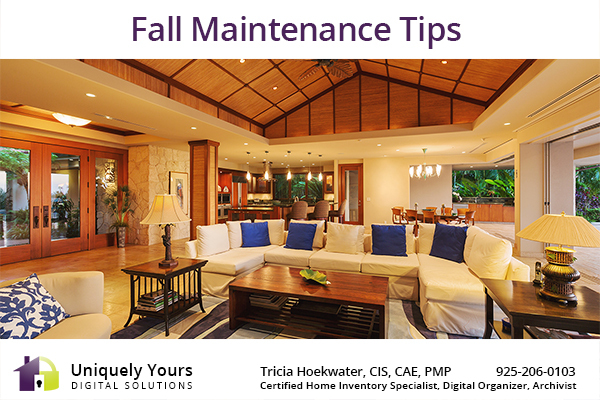 FALL HOME MAINTENANCE TIPS FOR YOUR CALIFORNIA HOME: Before the weather grows colder and wetter, prepare by performing some routine home maintenance. Check for and repair broken or missing shingles. Schedule an annual furnace tune-up. Make sure your trees are healthy. Enjoy the cooler weather that fall provides and prepare your home for the oncoming winter by performing these simple home maintenance tips now. Create a honey do list or contact your handyman (I can refer you to a great one in the Bay Area), or contact your HVAC provider. Catastrophe can happen in an instant. Take care of yourself…and those around you. You should also protect what you have! Get a home inventory today. I’m offering a 10% discount for any bookings confirmed by August 30, 2018. Contact me via phone at 925-206-0103 or by email uniquelyyours@outlook.com to schedule your inventory today.